The main opposition National Democratic Congress (NDC) is demanding the withdrawal of a Communiqué issued by the Electoral Commission of Ghana following an IPAC meeting which was held on Wednesday. 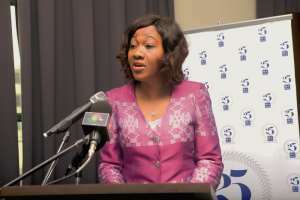 In a press statement issued on Thursday and signed by its General Secretary, Johnson Asiedu Nketiah, the NDC made it clear that the Communiqué issued by the EC covered aspects of the ensuing discussions but there are portions that do not represent the true reflection of what transpired at the IPAC meeting. The National Democratic Congress (NDC) notes with concern a Communique issued by the Electoral Commission after the IPAC meeting held on Wednesday, 27th March,2019. release issued by EC covers aspects of the ensuing discussions we note that there are portions that do not represent the true reflection of what transpired at the IPAC meeting. We wish to state emphatically and without any fear of contradiction, that no decision was taken on this matter. In fact, the compilation of a new voters register was only mentioned in passing by the EC during discussion on limited registration. It is self evident, and judging from the flow of the Press Release and its relationship with the agenda above, that item 3 is totally incongruous to the real issues discussed at the meeting, let alone any purported decision be made on the subject. The NDC holds the view that, a matter as important as the compilation of a new voters register, has to be discussed in a manner that will ensure that every aspect and the implication of its implementation are thoroughly discussed to the satisfaction of all stakeholders and in accordance with due process, time tested rules, procedures and conventions before a decision is made. A matter as delicate as such has to be discussed thoroughly and all the related consequences, ramifications considered before arriving at a decision. decisions was for the EC to decentralize the limited registration exercise to the Electoral Area level in accordance with the time tested practice in all limited registration exercises since the beginning of the fourth Republic.